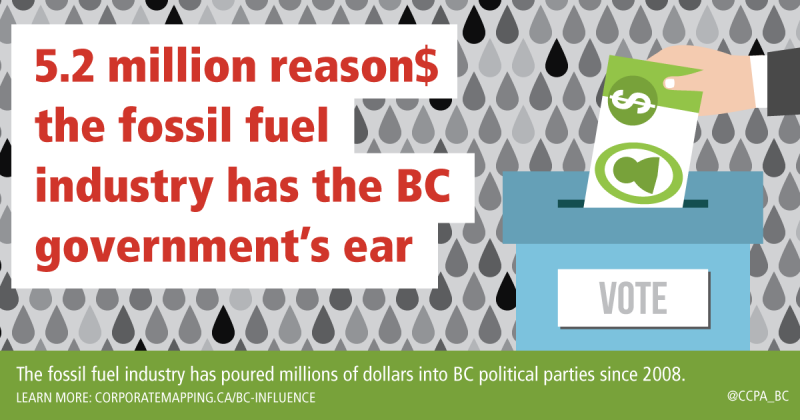 (Vancouver) A new study finds the policy alignment between BC’s provincial government and the fossil fuel industry may be explained, at least in part, by extensive donations to political parties combined with intense, sustained lobbying pressure on public officials. The study also reveals that most of the fossil fuel corporations and industry groups donating and lobbying in BC are headquartered in Calgary, the US and beyond. 48 fossil fuel companies and industry groups donated $5.2 million over the eight-year period between 2008 and 2015. Of this total, 92% went to the BC Liberal Party. The top 10 industry donors alone contributed $3.8 million to the BC Liberals and $270,000 to the BC NDP. In 2014 and 2015, newly formed LNG operators made combined donations of over $110, 000 to the Liberals and $15,500 to the NDP. Fossil fuel corporations and industry associations reported more than 22,000 lobbying contacts with public officials between April 2010 and October 2016. The majority of these—19,517 contacts—were made by ten corporations and industry associations, averaging 14 contacts per business day. There is substantial overlap between political donations and lobbying, with seven of the top political donors also ranking among the most active lobbyists: Spectra Energy, Enbridge, FortisBC, Encana, Chevron Canada, CAPP and Teck Resources. 28 per cent of lobbying by the top 10 most active lobbyists is with cabinet ministers—an unrivalled level of access. Rich Coleman, Minister of Natural Gas Development, is the most targeted minister with 733 reported contacts by the top 10 firms. This amounts to an average of nearly three contacts per week for Coleman alone. The next most contacted are Premier Christy Clark (618 contacts), Minister of Energy and Mines Bill Bennett (437), Environment Minister Mary Polak (354) and Finance Minister Mike de Jong (330). Almost half of lobbying contacts were with government ministries (ex, deputy ministers and other staff). The most targeted ministries include Energy and Mines (1,353 contacts), Natural Gas Development (1,045), Environment (1,026), Aboriginal Relations and Reconciliation (658), the Oil and Gas Commission (984) and the Premier’s Office (864). Both NDP and Liberal MLAs are heavily targeted. This is especially the case with the past and current leaders of the BC NDP, Adrian Dix and John Horgan, who are among the top three most contacted. Mapping Political Influence: Political Donations and Lobbying by the Fossil Fuel Industry in BC was published today by the Canadian Centre for Policy Alternatives as part of the Corporate Mapping Project (CMP). The CMP is a six-year research and public engagement initiative jointly led by the University of Victoria, the CCPA’s BC and Saskatchewan Offices, and the Alberta-based Parkland Institute. This research was supported by the Social Science and Humanities Research Council of Canada (SSHRC). For more information or to set up interviews please contact Lindsey Bertrand at lindsey@policyalternatives.ca or 604-801-5121 x238. Lindsey Bertrand is Communication & Digital Engagement Specialist at the Canadian Centre for Policy Alternatives – BC Office.